State Representative Sid Miller represents House District 59. He is a recognized as one of the state’s most dynamic and effective conservative leaders. In his sixth term in the Texas House of Representatives where he works to put his real world experience as a small businessman, community leader, agriculturist, former schoolteacher, and former school board member to work on behalf of the people of Texas, Sid Miller has emerged as the definitive pro-life, pro-family, pro-business, pro-jobs leader in the Texas Legislator. In the recently concluded 82nd Texas Legislature, Sid Miller, was the author of HB 15, the so-called "pro-life" sonogram measure, the passage of which had been declared an emergency item by Texas Governor Rick Perry. Representative Miller worked tirelessly to keep the pro-life protections favored by House Conservatives in the bill from being watered down by the Texas Senate, and because of his efforts, HB 15 passed both the Texas House and Senate by strong majorities. The resulting measure signed into law by Governor Perry gives Texas the strongest sonogram law in the nation and Miller’s efforts to protect human life and prevent countless abortions from being performed has been hailed by every pro-life organization in Texas including Texans for Life, Texas Right to Life, and the Texas Alliance for Life, Sid Miller is also recognized as one Texas’ staunchest defenders of our constitutional freedoms and individual liberties in the Texas Legislature, especially our 2nd Amendment rights to keep and bear arms. That is why Representative Sid Miller has been endorsed in every election he has run in by both the National and Texas State Rifle Associations for his efforts to protect gun rights, defend sportsman and hunters, and fight against any measure to weaken or abuse our constitutional protections. First elected to the Texas House of Representatives in the fall of 2000, Sid Miller was the only Republican to defeat an incumbent Democrat. He has been leading the fight against liberals in Austin and in Washington, D.C. and protecting the values of the hardworking families of Comanche, Coryell, Erath, Hamilton, Somervell and Mills Counties ever since. He is a two time recipient of the "Fighter for Free Enterprise" Award from the Texas Association of Business because of his strong pro-business voting record and he was named the "2nd Most Conservative Voter" in the Texas House by Texas Eagle Forum. Miller earned the Taxpayer Hero award from Texas for Taxpayer Reform for his efforts to protect the interests and pocketbooks of Texas taxpayers and he was named "Freshman of the Year" by his conservative colleagues during the 77th session. He has previously been named on Texas Insider's "Best List," Stephenville Empire Tribune "Reader's Choice" list, and was named "Best of the Legislature" for 2011 by the prestigious Capitol Inside. For his education efforts, Miller received the "Texas At Promise" award from the Coalition for Hope and Opportunity for Charter Education as well as the "Legislator Supporter Award" from the Texas Association of Community Health Centers as well as their award for Outstanding Service, and because of his conservative stance and dedicated votes to see that more tax dollars were directed to the classroom he was recognized for his support of education in Texas by the Region 12 School Superintendents. Sid Miller is a founding member of the Legislative Tea Party Caucus and serves as a member of the American Legislative Exchange Council’s Education Task Force. He is a member of the House Rural Caucus, the Sportsmen’s Caucus, the House Manufacturer's Caucus, House Veterans and Military Affairs Coalition, the Legislative Caucus for Missing and Exploited Children, and the bi-partisan Conservative Coalition. Miller has been selected by his Republican colleagues to serve as Chairman, Vice Chairman, Secretary, and Treasurer of for the House Republican Caucus and because of his extensive knowledge and work in agriculture, Miller was chosen to work directly with the Texas Department of Agriculture Commissioner as a member of the Agriculture Policy Board. He was also appointed by the Speaker of the Texas House to serve on the National Energy Council and he works closely with the Conservative American Legislative Exchange Council to better help serve the people of Texas. In January of 2011, Representative Miller was selected by the Speaker of the Texas House to serve as Chairman of the influential House Committee on Homeland Security and Public Safety where he helps direct the state’s response to the federal government’s failure to protect our nation’s borders and he has become a strong and respected voice on border security issues and the threat posed by our porous international border with Mexico. Miller also protects the free market and works to create new jobs and opportunities for Texas as a member of the House Business and Industry. He has previously served as chairman and vice chairman of the House Agriculture and Livestock committee as well as vice chairman of the House State Affairs committee. Miller is a lifetime member of the Houston Livestock Show and Rodeo, a member of the Associated General Contractors of America, and the American Nursery and Landscape Association and former director of the Erath County Farm Bureau chapter. The Stephenville Chamber of Commerce recently named him "Entrepreneur of the Year." Miller is an avid rodeo participant and was named the 2004 World Champion of Calf Roping by the United State Calf Roping Association. Winning the championship in 2004, Miller also set a world record as well. Sid Miller attended public schools and graduated from DeLeon High School. He is an honors graduate of Cisco Junior College where he received his Associates of Arts Degree. He is an honors graduate of Tarleton State University in Stephenville where he received a Bachelor of Science in Vocational Agriculture Education Degree in 1978. Representative Miller and his wife, Debra, live in Stephenville where their two sons Truett and Joseph, along with Joseph's wife Kelly, are all graduates of Tarleton State University. Debra is a teacher and founder of Erath Excels Academy with campuses in Stephenville and Taft. The Millers are active members of the Erath County Cowboy Church, where Sid serves as an Elder. 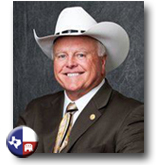 Click to read TexasGOPVote stories related to Rep. Sid Miller.